Some sites such as live.com, gmail.com will require a multi-step registration and/or forgot password workflows to validate you say you are. Having an opportunity working with the Twilio Cloud Communication Platform, exposed how easily this can be done with their Api’s. So for this post, I wanted to illustrate the steps in getting your MVC 4 application wired up with multi-step registration process with SMS code verification leveraging Twilio. 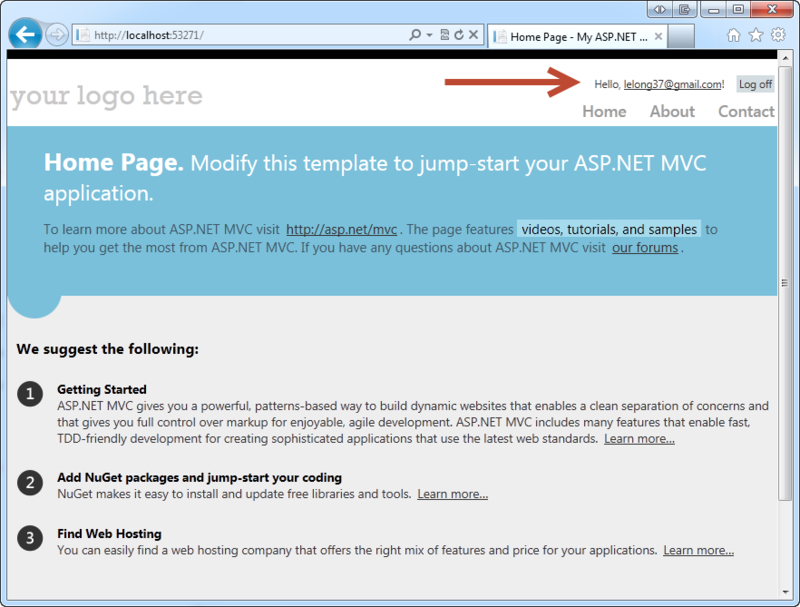 We will start from my last blog post with Seed Users and Roles with MVC 4, SimpleMembershipProvider, SimpleRoleProvider, EntityFramework 5 CodeFirst, and Custom User Properties. 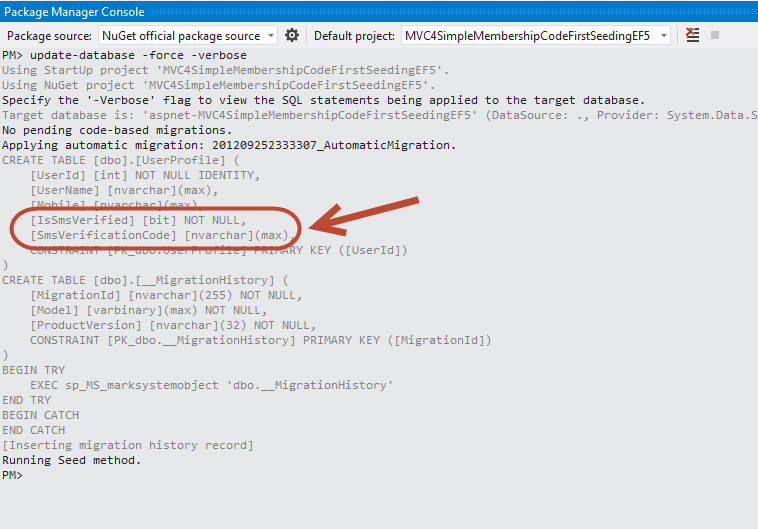 Since we already gathered the user’s mobile number during registration, let’s go ahead and add a property/field “IsSmsVerified” and run EntityFramework’s migration command update-database -verbose (so we can see what commands are being issued to our database for the migration. 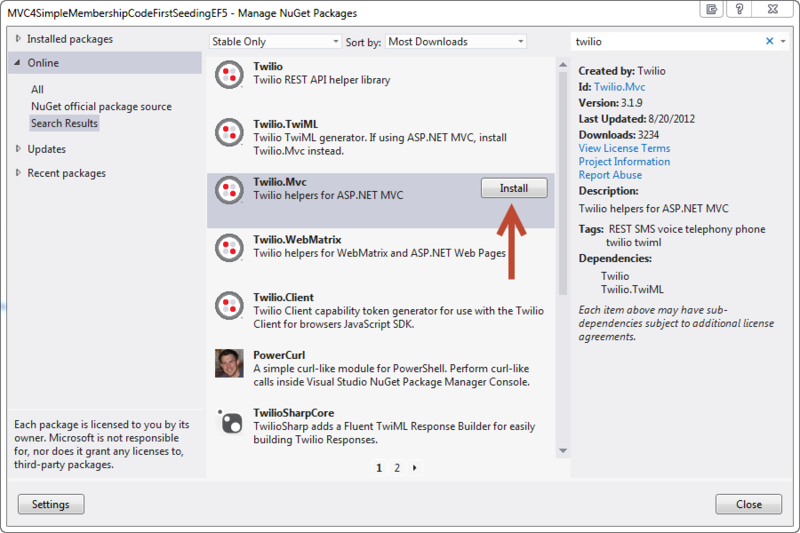 NuGet and install the Twilio.Mvc package. 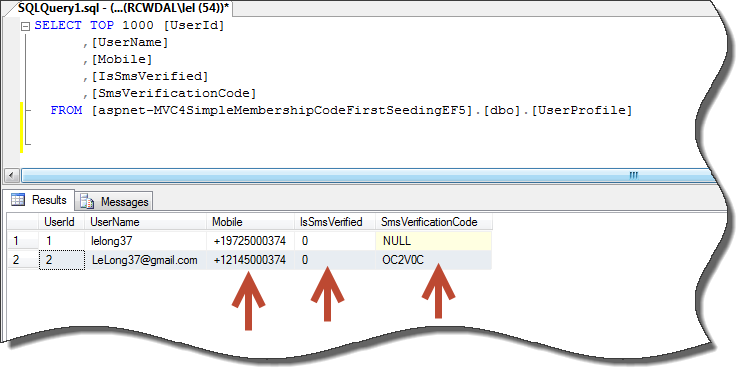 Update our UserProfile entity with IsSmsVerified and SmsVerificationCode properties. Update our Seed method so that we are not inserting nulls for the provisioned users. Now the fun begins, let’s update our AccountController. Update the Register(RegisterModel model) Action and introduce the second step registration process of entering an SMS verfication code that we send the user using Twilio’s REST Api Client. Note: We are just scratching the tip of the ice berg in terms of what the Twilio Cloud Communication offers, you can visit their docs site for more info. Add SmsVerification() Action, so that the user can enter the SMS verification code. Add SmsVerication(SmsVerificationModel smsVerificationModel) Action, so that we can validate the user, the user’s mobile number, and SMS verification code. Add GenerateSimpleSmsVerificationCode() method, a simple static helper method to generate a six character SMS verification code. We could combine the two actions SmsVerication() and SmsVerication(SmsVerificationModel smsVerificationModel) into one, by checking the request verb for GET or Post, however for separation of concerns we will keep them “nice” and “separate”. 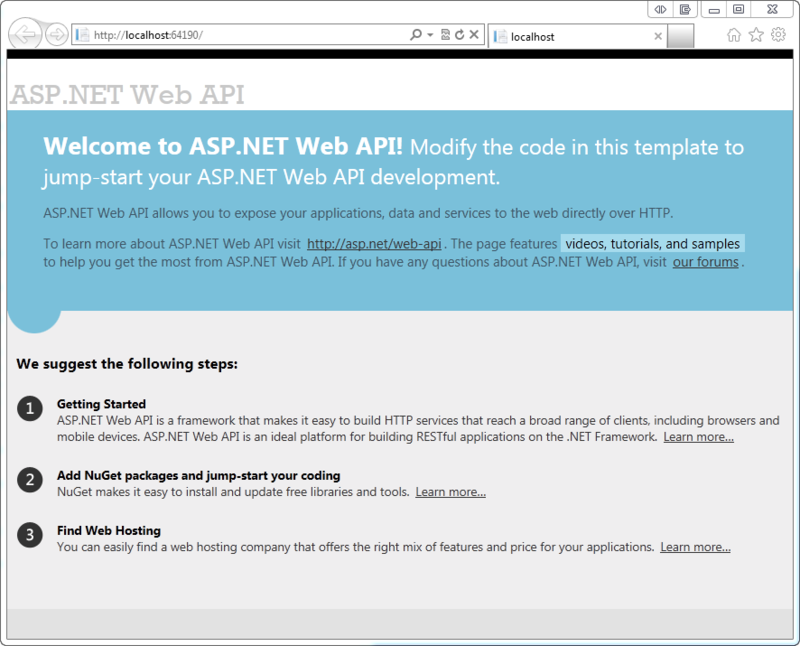 Let’s add some AppSettings entries to store our Twilio Rest Api credentials. Note: Your Twilio credentials for using their REST Api can be found on your dashboard after registering. Let’s create the SmsVerification View where a user can input the SMS verification code that we sent to the user bound to the ViewModel we just created. 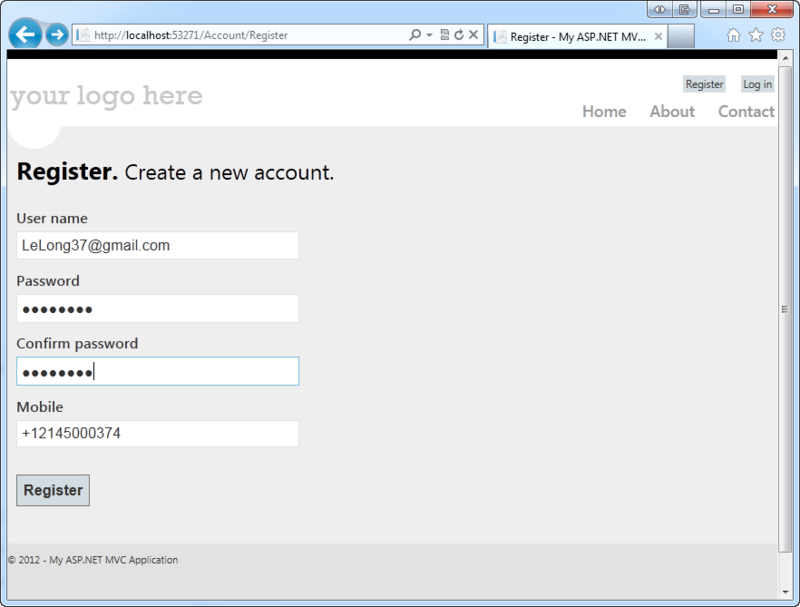 Step 1 of the registration process, run the application and register. For a quick sanity check let’s just make sure our SimpleMembershipProvider is persisting the extra properties we added earlier e.g. 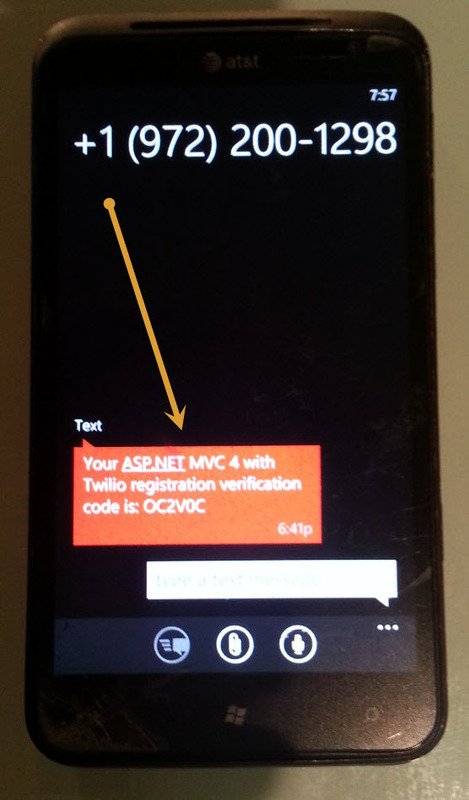 SmsVerificationCode, IsSmsVerified. Good, we can see here that Mobile, IsSmsVerified and SmsVerificationCode is being saved when we invoked the WebSecurity.CreateUserAndAccount method earlier from our Registration Action. Step 2, SMS notification to the user’s mobile number was received with the SMS verification code. 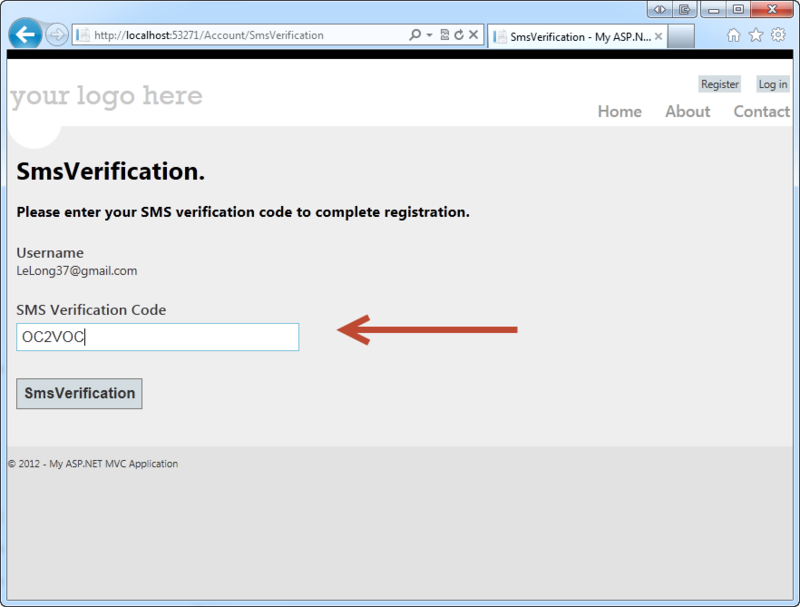 Step 3 of the registration process, input the SMS verification code in the SMSVerfication View. You have now successfully completed the 3 step registration process and have been automatically logged into the site! Now there are obviously TODO’s here, you can create an new authorize Attribute to verify that the IsSmsVerified property for the user is not false, clean up how we are storing the RegisterModel in session, additional bullet proofing the app in terms of security gaps, etc.. However the emphasis of this blog was multi-step registration to for increased validity of the user. Last but not least, you can use the a similar implementation for things like forgot password or any other type of workflow that needs that extra degree of validation.